I’m not coming to your conference if there aren’t women on the platform. I’m not coming to your conference if there aren’t people of color teaching and not just entertaining. There. I said it. I said what my spirit has been screaming for all 20 years of ministry I’ve walked in. If your conference does not have people that look like me-I am not welcome. Well at least that’s what it gives off. As a Black woman in America I am often in spaces that don’t look like me. But when I come to learn in the House of the Lord I should feel free. I should be affirmed that God took time to craft my femininity and Blackness because He too LOVES diversity. I should see Black men teaching classes on prayer and not only on instruments and microphones because their talents are the only reason they have room at the infamous table. I should see Latinx women facilitating classes on discipleship. There should be Asian men teaching on worship. I want to see my Native brothers and sisters leading us in High praise. But I don’t see that. And it grieves me. It grieves me that we say we are Christians and love all-but Sunday is the most segregated day of the week. Please understand I attend a plethora of conferences. One of my Top 5 Gallup Strengths is Input-so I collect information. It makes for a pastor who loves to study, read, and yes-attend conferences. But I’m tired! I’m tired of showing up excited, only to hear from one walk of life lens from the stage. I’m tired of looking through agendas and seeing the same type/color/gender of face. I want to see ALL that God created fully functioning. I don’t want to go to church only with people who look like me. How do we fix this? We go out of our way to plan joint events with the youth ministry from across town. We budget for diversity training within our staff. We push for women in leadership on the front of our conference fliers. We celebrate Black History Month at our churches and not just on social media. 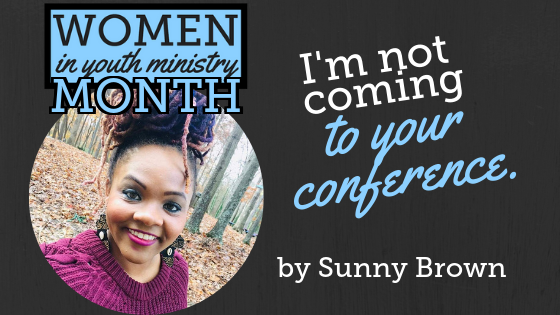 We learn about powerful women of God in ministry for Women’s History Month. We can learn songs in Spanish for Latin American History Month. We speak up when we see a lack of diversity in our meetings. We say something for those who aren’t at the table! Then take a hard look at the room and see if women and people of color are even represented there. We can’t speak for everyone-but we sure can make space for everyone to speak for themselves. And yes I know speaking up in a room full of powerful people can be intimidating…but do it anyway. Refuse to settle for comfortable, strive to be like Jesus and push to embrace the radical. Isaiah 1:17 admonished us to ‘do right, seek justice. Defend the oppressed…’ and if we aren’t doing this in our churches by making safe spaces in our sanctuaries-Why are our doors even open? If I’m your sister in Christ show me I’m welcome. Show me that I matter. Show me your full embrace. Be like Jesus-embrace the radical.